Previous What’s Inside a Mosque? Dear readers: Sorry my blogs have been few and far between these days. I seem to be experiencing some kind of “blog block.” And apologies to the Professional American Women of Turkey, who have already read a version of the story below. “Try to remember that you are a guest in their country. Try to be respectful.” University study abroad brochure. As many of you know, it was quite a challenge for me to get used to living in a Turkish mega-city. But now, after two years in Istanbul, I generally feel competent as I run errands, head to my volunteer job, meet friends for tea and lunch, and guide visitors. When I encounter a situation that gets the better of me, I hesitate to share it because it represents failure. But it’s all part of the expatriate experience. I went to Istanbul’s enormous Grand Bazaar yesterday to look for Ottoman cloth for some pillows I wanted to make. A friend recommended a shop called Deregozu. When I arrived there, I noticed it was smaller than most Grand Bazaar shops, many of which are the size of walk-in closets. I told the proprietor, a man named Hassan, what I was looking for, and he insisted on walking me to the Deregozu warehouse, a few blocks outside the bazaar, to view a larger selection. At the warehouse, it was quickly evident that Deregozu did not have the elegant, thick cloth with slender tulip designs that I sought, but instead lots of suzani embroidery work and colorfully-dyed silk ikat. Hassan offered me a cup of tea and, along with several other customers, I looked around. I noticed a piece of fabric covered with attractive needlework called kaitag, from Daghestan (the name of this area of the world would become notorious a few years later because the Boston Marathon bombers hailed from there) in southern Russia. When I asked the price, Hassan quoted me $200 (400 Turkish Lira — TL). While I pondered whether to offer a lower price, he said goodbye and I was left with his friendly brother, Hamza, and Ayse, a sweet, young headscarfed woman. 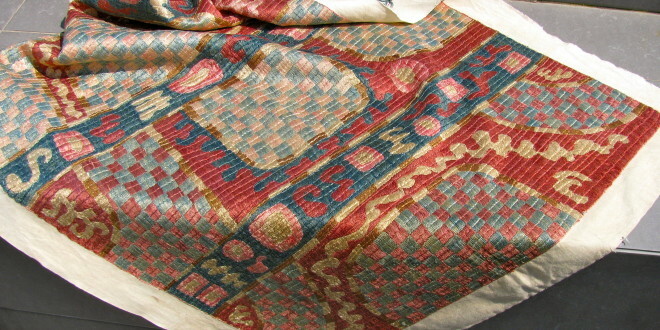 I looked around some more, and then asked Hamza for the prices of a suzani table runner and the Russian piece. He replied that they were 250 TL (about $125) each. Pleased, I picked up the Russian piece to buy and offered a debit card, which Hamza told me the shop did not accept. Opening my wallet, I noticed I had just 250 TL inside. Hamza told me I could pay later, but I told him no, I would pay now, but would then need to be directed to a cash machine so I would have some cash for lunch and the trip home. I completed the transaction and said goodbye and thanked Hamza. He offered me a stack of business cards to give to friends. Then Ayse took me down the street to the cash machine. As we walked, we chatted about her English studies, and she asked where in Istanbul I lived. When we reached Garanti Bank, I said goodbye to her and got in line. “Hmm . . . okay,” I replied. I had repeated the lira price to Hamza several times in both English and Turkish to make sure I understood it. He had nodded in agreement. Had I mixed up two hundred and three hundred in both Turkish and English? That didn’t seem likely, but now I felt confused. The Garanti machine thrust out my cash and Ayse was standing there with her hand open. I gave her 100 TL and she turned and was gone. I quickly realized I had been scammed: deceived, or at the very least, mistreated. I was angry at the Deregozu shopkeepers but also at myself. There were other ways I could have handled the situation. I could have marched back to the store and asked for my money back, apologizing for “my error” and telling them 350 TL was simply too much. But I didn’t. Although I’m proud of my progress with Turkish, it is easy to knock me off balance, language-wise. On top of that, I carry with me the firm belief that I am a guest here in Turkey and should avoid unpleasantness. Most of the time that works well for me, preventing an impatient comment or roll of the eyes, and causing me to observe the people around me and act as they do (for example, remaining quiet on public transportation). But wise as that sentiment is, how can I turn it off when an unpleasant situation suddenly arises? In my case, I simply cannot. Oh well. My positive interactions here outnumber the negative by at least 50 to 1. Yesterday’s incident was simply part of the (low) price I pay for living here.